So, it’s been over two years since I last made naan-style bread. That’s a long time for me to wait to make something that I enjoy so much. But there was a pretty valid reason for it.If you’ve been following me and my blog for a while then you might remember this story. But if you haven’t been following and/or don’t remember then…what the heck? I’ll recap. See, the last time that I did make naan, I kiiiiiinda started a fire in my oven. Oh, yeah. You read that right. I made one or two pretty serious (and in retrospect, quite silly) mistakes and those mistakes ended up starting a fire. Not to worry. It wasn’t a huge one. No extinguisher was needed. 911 was not called. Everyone is fine. But it still kinda freaked me out. Since it was my first time making naan I had done some research and seen that the majority of chefs and recipes recommended making it on a pizza stone in the oven with the heat cranked up nice and high–as in, as hot as it could possibly get in order to get those lovely dark blistered spots on the surface of the naans. Since I did have a pizza stone, I figured that I should keep up with Joneses and go ahead and use it. The problem came around after the dough had had its final rest and it was time to actually cook them. I was supposed to brush them with melted butter, then plop them down on the pizza stone for about 1-2 minutes per side. These…were not very good instructions. In retrospect I really cannot believe I was so stupid. I mean…extremely high heat and melted grease just don’t typically mix well together in any capacity. I should’ve known better and known to make the judgment call to just brush the butter on AFTER the naans had done cooking. But I didn’t. So, what happened was, the butter was sliding off the naan and onto the pizza stone. This wasn’t such a big deal in the beginning. But then, it started sliding off the stone and onto the oven floor. The 500 degree fahrenheit oven floor. You see where this is going, right? After about the third or fourth naan, there was a mini flare up in the oven. I screamed. Then I shut the oven off, walked out of the kitchen and sat down in a chair to calm down. About oh…fifteen minutes later I went back in the kitchen, feeling pretty calm and chill. I pulled out a non-stick skillet from the cabinet, put it over the stovetop and turned the heat on medium. Then, I finished the rest of my naans. They were delicious. Fast forward two years later. I was making an Indian entree dish for the first time and I just knew that it wasn’t going to feel complete without some from-scratch naan bread to eat with on the side. I was prepared for it this time. I knew that I could probably go ahead and use the pizza stone again without having the same incident that I did before, but with summer fast approaching and a tiny kitchen through which the A/C doesn’t ventilate as well as it could, who feels like cranking up the oven to a million degrees? Not me. So I just went ahead and used my non-stick skillet to cook my naans once again. And as you can see, it didn’t force a sacrifice at all on getting the lovely blistered prints on the dough. 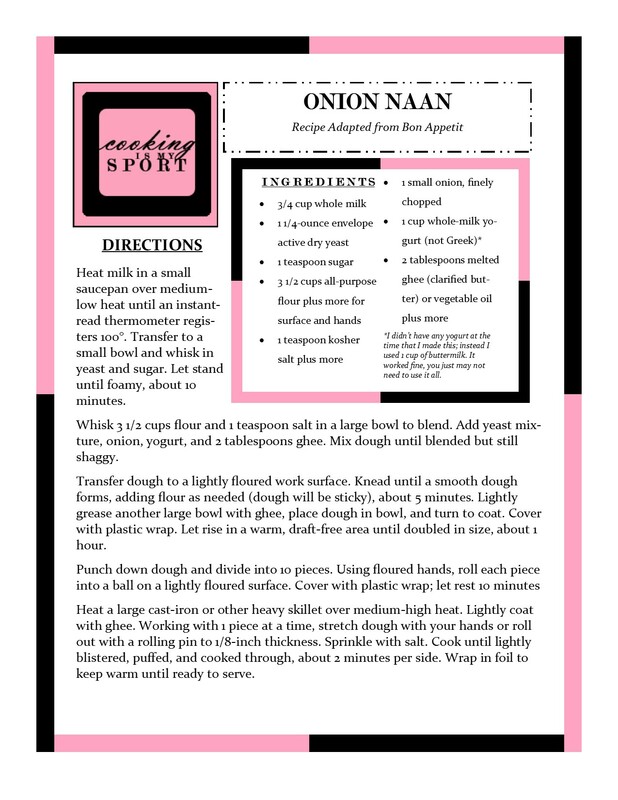 Notes on the actual recipe: Dice the onions as small as you possibly can. When onions get VERY small and thin and are exposed to high heat, they sometimes disintegrate. This actually will work in your favor; the flavor of the onion becomes even more absorbed in the dough that way and it’s more tha flavor that you want and not so much a chunk of onion in your mouth. There is flexibility in using regular butter or vegetable oil in the recipe, but I’m going to go ahead and insist that you make an effort to use the ghee. As someone who has made it both ways, there IS a noticeable difference in the taste when using ghee as opposed to vegetable oil. Plus, ghee is something that can usually be found down the ethnic/foreign foods aisle of most standard grocery stores. Notes aside, This bread is SO good. The onion flavor is just outstanding. I actually prefer this recipe to the one I’ve used before; the bread comes out VERY chewy and tender on the inside and also reheats VERY well in the microwave whereas sometimes leftover naans can have a tendency to get tough. Really good stuff here, guys. *I didn’t have any yogurt at the time that I made this; instead I used 1 cup of buttermilk. It worked fine, you just may not need to use it all. Heat milk in a small saucepan over medium-low heat until an instant-read thermometer registers 100°. Transfer to a small bowl and whisk in yeast and sugar. Let stand until foamy, about 10 minutes. Whisk 3 1/2 cups flour and 1 teaspoon salt in a large bowl to blend. Add yeast mixture, onion, yogurt, and 2 tablespoons ghee. Mix dough until blended but still shaggy. Transfer dough to a lightly floured work surface. Knead until a smooth dough forms, adding flour as needed (dough will be sticky), about 5 minutes. Lightly grease another large bowl with ghee, place dough in bowl, and turn to coat. Cover with plastic wrap. Let rise in a warm, draft-free area until doubled in size, about 1 hour. Heat a large cast-iron or other heavy skillet over medium-high heat. Lightly coat with ghee. Working with 1 piece at a time, stretch dough with your hands or roll out with a rolling pin to 1/8-inch thickness. Sprinkle with salt. Cook until lightly blistered, puffed, and cooked through, about 2 minutes per side. Wrap in foil to keep warm until ready to serve. Good for you and shame on me. I’ve yet to attempt making naan bread and I claim to have been born in India LOL! However, I was 3yrs old when my family left India, so I guess I have an excuse :). Seriously though, after looking at your amazing results (the first time doesn’t count), I’m convinced I need to make these myself pronto! Great job Jess! It’s never too late to try them out Loretta- thank you! I’m definitely making these. I love naan but haven’t made home made in ages and have never made homemade onion ones. awesome! I adore naan but have ever tried making it. So yum! You should really try it out, it’s not difficult at all and the results speak for themselves lol Thank you! This is making me want naan right now! This looks fantastic! A pizza stone really is a nice touch, but it’s not necessary. Don’t be afraid! It’s really not scary at all with the skillet and it tastes SO good. Thank you! Never made naan myself. These look absolutely INCREDIBLE. You have inspired me once again. 🙂 Nice work! I would say these are beautiful Naan. I can only imagine the sweet butter onion flavor. What’s a little fire after all? Well, I night be freaking out a bit. These look wonderful, I love the idea of cutting the onion up so small that it almost disappears but flavors the bread. I have never made naan before but this might tempt me. They look like fluffy pancakes, so light. Could I use greek yoghurt instead or is there a reason I should not? I only ever buy greek yoghurt. No fire this time? Doubly successful then, Jess! Looks amazing. It’s been about 2 years since I’ve made naan too…thanks for the push! Jess, your onion naan looks better than those made in the restaurants! Thanks for sharing!